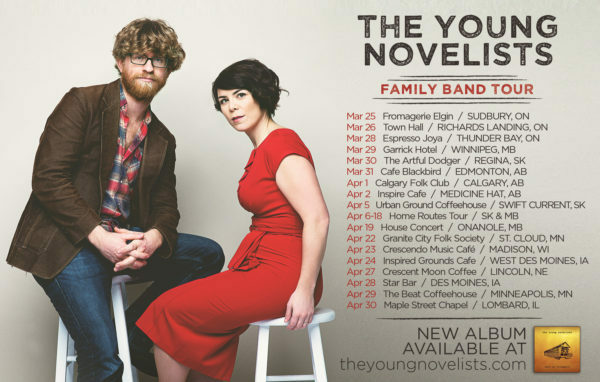 The Young Novelists | » Family Band Tour! Spring is the time for roaming the countryside! We’re about to leave for a 10-week tour that will take us from Sudbury to Edmonton, Calgary to Chicago, Philadelphia to New York City to Washington DC to Boston to Halifax and back to Saratoga Springs NY! At the end of the tour, we even get to play some full band shows in Toronto and Wakefield, just to put the icing on the cake. We would love to see you at a show! Full tour dates are HERE. We are traveling on this tour with our son, Simon, (hence the “Family Band Tour”!) so if you have kid-friendly touring ideas we would love to hear them.